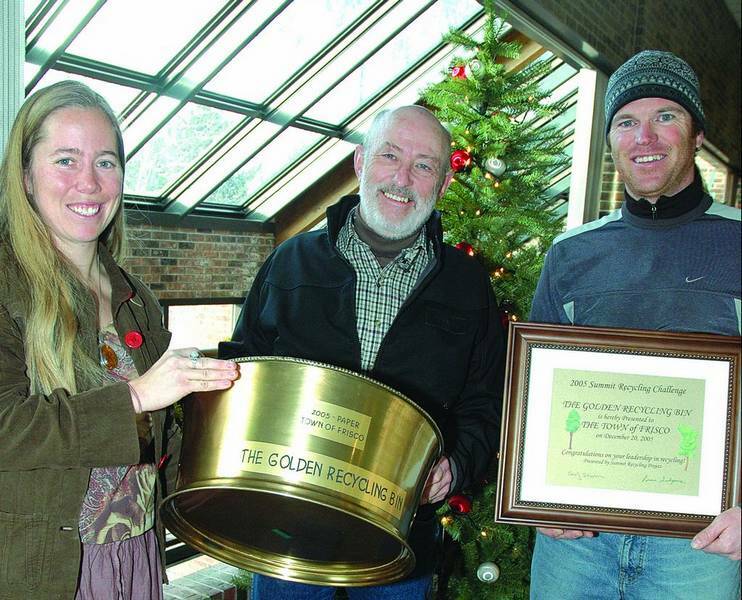 FRISCO – And the golden bin goes to … Frisco.On America Recycles Day, Nov. 15, Summit Recycling Project (SRP) challenged local towns to collect as much mixed-paper recycling as they could in one month’s time. Each town took it upon itself to get the word out and encourage employees, residents and businesses to clean out their files and recycle paper. SRP weighed the paper then calculated a pounds-per-person total to even the playing field between larger and smaller towns. Carly Wier, executive director of SRP, announced the winner last week, and Wednesday she presented Frisco with a Golden Recycling Bin to display in town until next year’s challenge. “The numbers are in, and they were great for everyone,” Wier said. “Officially, Frisco was the winner, but I’d say the 492 trees that were saved and the good green vibes we all now emanate are the real winners.”Frisco recycled 13.67 pounds per person in a month; Breckenridge came in second with 12.65 pounds. All four towns recycled 41.44 pounds per person.”We were totally impressed by the numbers from all of the towns,” Wier said. “It just goes to show how seriously Summit County folks take their recycling.”Frisco employees showed great enthusiasm the opening day of the challenge – some went so far as to dress in a newspaper skirt and hat Nov. 15. “The environment is a big priority, and that shows up in most discussions we have on most issues,” said Julie Sutor, executive assistant for the town of Frisco, adding that the town’s recycling priority is also reflected in the community at large.In January, Wier will meet with various town departments and conduct a recycling audit to make sure they’re diverting as much waste from landfills as efficiently as possible, Sutor said.”I urge everybody to keep recycling, because we have these resources available in Summit County to protect the environment,” Wier said.Next November, Frisco will have to compete for the golden bin again. “There really are no losers in this challenge,” Wier said. “It was fun and in the process we saved a lot of resources by recycling this paper, including enough energy to power six households of four for one year. Who knows what will happen next year, its anyone’s game …” In the meantime, people will have to keep filling that golden bin.